Just to clarify, I am not a professional hiker. 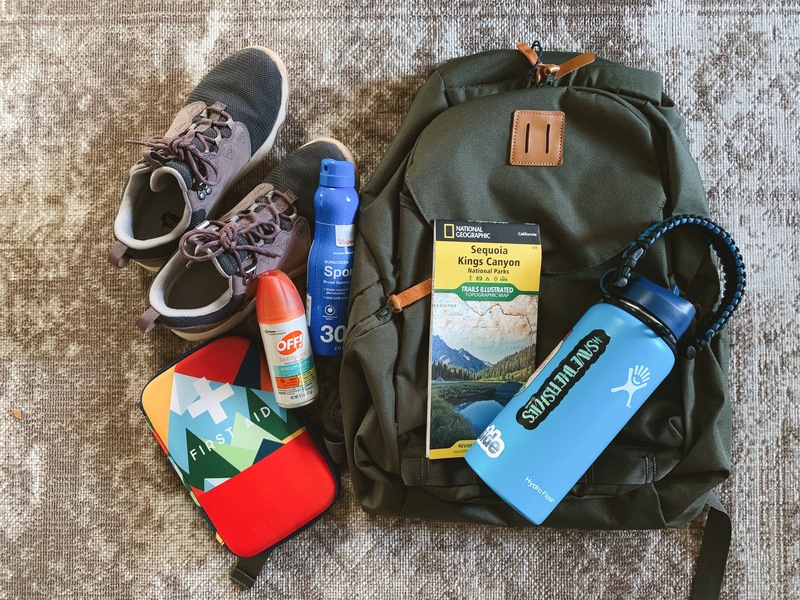 Rather, I enjoy hiking and the items mentioned in this post are just a few of my favorite things to take with me whilst hiking. I recently got Teva Arrowood Trail Sneaker from my parents last Christmas and they’ve been an upgrade from my Columbia hiking shoes. These shoes are waterproof and are seriously the best!! When buying hiking shoes, make sure to go up a size that way it gives you more room during winter/colder hikes to wear thicker socks (or layers of socks). I live by my Hydroflask. They’re a little pricey for what they are but they are worth the investment (I have over four of them in different sizes) – they keep your water cold or hot for at least twelve hours. I use the 32 oz wide mouth with the straw lid. I’ve attached it to a paracord so carrying it is more convenient. Pro tip: during the holidays, most outdoor shops (such as REI) will always have a sale on these flasks! If you know me, you know I love a good backpack! The one pictured is my 25L Rift backpack from United by Blue. I like to alternate my backpacks during my hikes as I’m still trying to figure out which one is most comfortable for hikes. The other backpacks I frequently take with me on hikes are the Fjallraven Kanken and the REI Co-op Rucksack. When it comes to the pack, there are a few things to consider with the main one being how long the hike is. Backpacks ranging from 18L-25L are typically good for day hikes. It’s also ideal to buy your backpack in store that way you can get a good feel of it on your back. Other important things I like to take with me on hikes are sun screen, bug repellent, first aid kit (a nurse is never off duty, if you ask me), snacks (preferably high on protein or energy gels) and an old fashioned map. The map is great, especially when cell service can be limited when deep in the forest. Unfortunately, my map reading skills are still very novice; however, Chris is great at reading them – guess that’s why we make the perfect team! Trails and hikers are different in their own little ways. When going on a hike, make sure to read more about your trail and pack appropriately. Most importantly, make sure to enjoy your time spent in nature! You’re a professional hiker in my books, hehe. I tap out so easily @__@ but you’re a true rockstar at it! Oh shoot, I should look into Teva’s hiking shoes for my boyfriend, hehe. YASSS on Hydroflasks! They’re great and super stylish. I like that you keep your hiking gear to a minimal, where you’re not carrying something excess. Oooh, I would’ve never thought of bringing a first aid kit but that is super important. Thanks for sharing this list!! All necessities set :’) Love hiking! I love hiking. I try to go almost every weekend. Such a great way to be out in nature. These are some great tips. I don’t really go on hikes. It’s not a huge or popular passtime here where I live then it is in the US. That said there are many hikes I want to go on when I get back to the USA next and frankly all I had in mind was a pair of Nikes and some sunblock! I must sound so ridiculous! Ohh thanks for sharing this. Such a great post. It does shock me how often I come across people out without a map, where are they going?! I can’t wait to go on more walks/hikes after baby Gamble arrives. I have missed my long walks, proves difficult when heavily pregnant. I love hiking. These are all things I would take with me too, but I’d also add an emergency whistle and a compass. I love hiking & I really aught to go a little more often! I’ve never been hiking before but my Husbad really wants to take on this adventure sometime this summer! Thanks for the info! you hit all the necessities! I always make sure to take more than enough water just in case! you never know who may need it! The map would be utterly useless in my hands but everything else is a definite in my books. I’d love to get into hiking, I bet it’s such a freeing hobby and way to spend your time. Hiking is the best and you’ve got all the essentials! I’ve never heard of those trial sneakers before but my trip this summer is going to be a lot of hiking so I’m going to look into getting a pair. And yes to having sunscreen and snacks! Sun screen is so important & I’m always in need of bug repellent! These are great and needful items to have on hand! Hiking has always been one of my favourite things to do. My parents started me on my love of it when I was little and we used to go on Volksmarsch’s when I was younger in Germany. My husband and I have been back into it the last few years but not as much as I want. It’s neat to see what other people take on their hikes with them. We always have water, sunscreen and bug spray. Never really thought about a first aid kit but I will now! I also usually have my camera and lately some geocaching swag with me as well as we started geocaching. Your post was so handy! I´ve never heard of Teva before, just need new hiking shoes right now! Will check the sales for Hydroflask! I really wish I lived somewhere I could hike more instead of going to the gym. These all sound like pretty handy essentials, especially the bug repellant because I’m always the one who gets bitten tonnes whilst they don’t touch my other half! I love this! A first aid kit is always a necessity for me – I’m so clumsy! When it comes to hiking, gear is important. I often heard it said that good footwear is essential. Boots that are comfortable but that also keep our feet safe are a must. Backpack and water bottle are key items as well. First aid kid is important too! I love hiking, even if it often leaves me out of breath- I need to get my iron levels up. These are great hiking gear tips. Great post! I’m always looking for outdoor item reviews. I’m really interested in the water bottle you have, I’ll have to check it out. Never thought about a map, great suggestion! I haven’t been hiking since I was a teenager in Girl Scouts Mt Shasta California simply beautiful. Great looking hikes…I’m not a professional “hiker” either, just love to get out in nature, and it really is important to plan right! When I need to buy something for hiking or walking in the woods, I will be referring back to this post. I love all your valuable tips for hiking shoes, backpacks, sunscreen, bug repellent, etc. Thanks for sharing this post. Such a helpful post with great tips like the first aid kit! I would love to go hiking more often and reconnect with nature. A map may not be so helpful for me since I’m not the best at reading one! Such a cute looking first aid kit and that hydroflask looks superb. Bringing a map should be a number one priority as people only rely to phones these days. I always like to try on a backpack before buying too 🙂 And my map reading skills are questionable too so maybe I need to find a Chris haha! I looooove hiking and being in nature. I am definitely going to look for these boot suggestions! Great things to pack! Dad taught me to always take my hiking socks with me when we went shopping for boots to get the fit right with the socks I’d be wearing when I used them. I’d also recommend taking about 50% more water than you think you’ll need if you can carry it. I tend to get hiking gear from Karrimor and find they’re quite good quality. I’ll look into Teva next time I need some boots. Great hiking essentials! I’m loving the backpack…United by Blue is one of my favorite brands! And I’m definitely a huge fan of Hydroflasks as well! Thanks for sharing! Off Lotion is a must indeed!